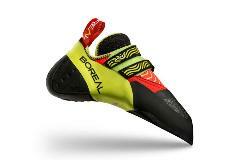 BOREAL Synergy is designed for optimum feel. A highly aggressive last shape is carefully blended with superb sensitivity and supremely sticky BOREAL Zenith Ultra™ rubber to enhance the natural qualities of the foot; a true synergy of design, materials and craftsmanship, enabling you to push your limits on any bloc, both indoor or on rock. 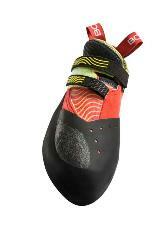 Synergy features a highly asymmetric and downturned last to optimally position the foot on steep rock. The lined, synthetic upper with strap closure comfortably holds the foot, and ensures minimal stretch over time. The rand and toe patch are constructed from a single piece, and combined with an area of our Friction Skin rubber coating, provides outstanding friction and sensitivity for toe hooks. Eliminating the midsole results in a highly sensitive and soft feel, ideal for marginal smears and standing on volumes. Our soft and sticky Zenith Ultra™ rubber compound is optimized for performance on marginal smears. 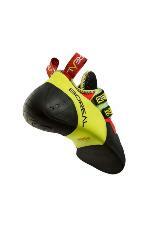 Synergy is ideal for competition climbers and boulderers looking for maximum sensitivity and feel. SYNERGY | Designed for optimum feel. A highly aggressive last shape is carefully blended with superb sensitivity and supremely sticky BOREAL Zenith Ultra™ rubber to enhance the natural qualities of the foot; a true synergy of design, materials and craftsmanship, enabling you to push your limits on any bloc.